BLACKSBURG, Va., Oct. 11, 2010 – Virginia Tech Corps of Cadets alumnus Capt. Daniel Richardson, U.S. Air Force, who earned a degree in industrial and systems engineering from the College of Engineering and a minor in leadership studies from the Virginia Tech Corps of Cadets Rice Center for Leader Development in 2004 has been selected as the Hokie Hero for the Virginia Tech versus Central Michigan University game. The corps Hokie Hero program started in 2006 by ISP Sports and sponsored by the University Bookstore, honors Virginia Tech Corps of Cadets alumni who are currently deployed. Recipients of this honor are highlighted by Bill Roth and Mike Burnop during the radio broadcast of Virginia Tech football games, on the corps website, on the corps alumni website and in the Corps Review magazine. 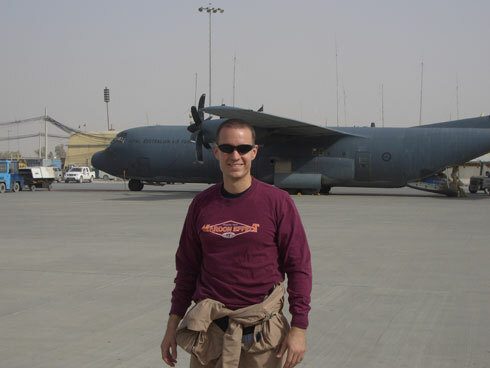 Richardson is currently stationed at Ali Al Salem Air Base in Kuwait, as a member of the 817th Expeditionary Airlift Squadron. He flies the C-17 aircraft, sustaining operations in both Iraq and Afghanistan via troop and supply movements as well as combat airdrops to remotely deployed personnel. Richardson is from Springfield, Va., and this is his second combat deployment. A Class of 2004 graduate of the Virginia Tech Corps of Cadets, Richardson was the regimental commander during his senior year and was the first of seven consecutive cadets to be selected as the Virginia Tech Undergraduate Student Leader of the Year. Richardson says he sends his love to his wife, Christie Roark Richardson who earned a degree in industrial and systems engineering in 2005 from Virginia Tech; his parents, Ron and Kit, both 1975 Virginia Tech graduates; and his sister, Kate, who "beat him at a lot of things, but whose Orangemen wouldn't stand a chance in a football game against the Hokies." The Virginia Tech Corps of Cadets has produced military, public, and corporate leaders since the university was founded in 1872. It is one of just two military corps within a large public university. The corps holds its members to the highest standards of loyalty, honor, integrity, and self-discipline. In return, cadets achieve high academic success and a long-lasting camaraderie with fellow members. Virginia Tech, the most comprehensive university in Virginia, is dedicated to quality, innovation, and results to the commonwealth, the nation, and the world. Below are the previous Hokie Heroes from the 2010-11 season.